I play EDH, I prefer to run Mardu colors always. No opinion is greater than another, but they're always worth discussion like they are. April 11, 2019 10:40 p.m.
@Funkydiscogod, There's a few problems with Torment of Scarabs that I think you are over-looking. Limiting the effect to creatures is important otherwise your opponent has more options to choose from, and giving your opponent more options to evade damage is not a good aspect as they'll probably just discard the creature removal spells they won't be using against you. Also Torment of Scarabs 's sac/discard effect is optional if you reread the card because it says "unless." Another issue with Torment of Scarabs is that you have to enchant it on a player which won't do anything if they have a Leyline of Sanctity on the field whereas Mogis bypasses that problem. 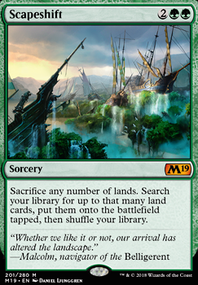 Furthermore as I have stated in my post that the removal spells in the deck should include sacrifice effects, exile effects, and boardwipe effects which would be used to handle multiple creature scenarios as well as functioning as card advantage. Lastly Mogis does more damage if the Torment gets removed early as you have brought up by comparing their durability. April 11, 2019 11:45 a.m.
@SynergyBuild, I think your standards are a bit too high. Unless you're advocating for Loxodon Smiter any card can succumb to Thoughtseize and counter magic, and Loxodon Smiter to me seems much more fragile in comparison. That said Mogis can still bypass counter magic if you're running Cavern of Souls and it can bypass Thoughtseize if you're running Kolaghan's Command . 4 Cavern might be too much, but I don't think having 1 will ruin the manabase either. Heck it can be a sideboard card for when you're up against a creature-lite blue deck if you need variance. April 11, 2019 11:22 a.m. This is a brainstorm thread as I don't have a deck list, rather I wanted to float the idea around and gauge the reactions and suggestions to this potential deck concept. That concept being lockdown control with Mogis, God of Slaughter as the win condition. 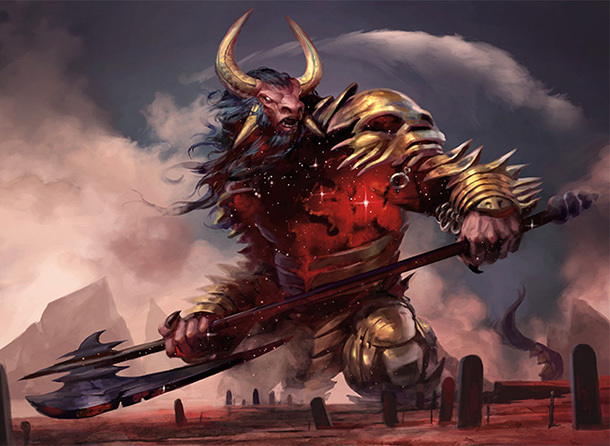 Why Mogis, God of Slaughter? 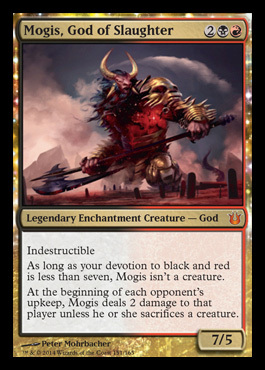 We won't be giving Mogis any devotion so he'll be an indestructible enchantment which is near impossible to remove in the Modern environment. Because he can stick on the field and has the capability to consistently deal non-targeted damage we're likely going to be focused on using all other cards in our deck to drag out the game as long as possible if not indefinitely. This way Mogis will eventually deal 20 damage to our opponent and there's nothing they can do about it. 1-2-3 ~ Dies to Me: As you can presume the rest of the deck will consist entirely of removal. As it stands Mogis can only deal damage if our opponent doesn't have any creatures to sacrifice and our opponent will try to win by using creatures to attack us. Therefore the more creatures we can remove the longer we live and the easier our opponent loses. 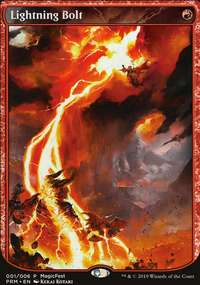 Lightning Bolt won't be good enough as our removal package must be able to remove any kind of creature, so exile effects, sacrifice effects, and boardwipe effects are crucial for always keeping the battlefield clear. Other cards to consider: Declaration in Stone , Crackling Doom , Dreadbore , To the Slaughter . Lands? Other than color-fixing this deck will want to run a full play set of Cavern of Souls as it will make Mogis, God of Slaughter unable to be countered which is helpful against blue control decks. Bad Match-Ups and Deck Weaknesses? All deck archetypes have bad match-ups, and this deck concept is far from perfect either. While most decks will lack the resources needed to answer this deck other ones can still bypass this strategy easily. 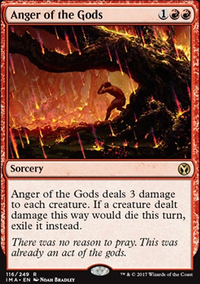 Burn is a hyper aggressive deck and even if we remove all their creature threats swiftly, their array of burn spells will eventually out-damage our Mogis. Tron is another problem for different reasons as cards like Karn Liberated , Ugin, the Spirit Dragon and All Is Dust can all remove Mogis, God of Slaughter easily which can result in a long stalemate between the two decks due to our abundant removal. Lastly non-creature combo decks like Scapeshift and/or Ad Nauseam are mostly unfazed by our onslaught of creature/planeswalker removal spells and just like the burn deck they will be able to out-race us with little to no problem as well. Sideboard and Answers: While sideboards are to be tailored to any given player's meta the above cards listed might help when dealing with the earlier described bad match-ups. For Collective Brutality all modes are relevant when dealing with burn and it can help remove cards like All Is Dust or Scapeshift . 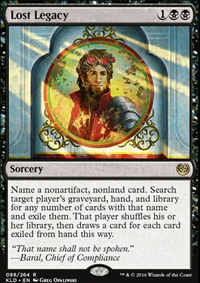 Leyline of Sanctity is probably the best card you can use against burn decks while also protecting Mogis, God of Slaughter from being removed by Thoughtseize or Dromoka's Command . 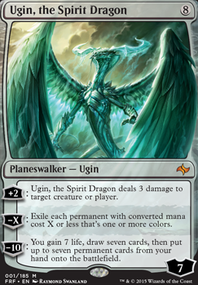 Lost Legacy can also remove key cards from problem decks like Ugin, the Spirit Dragon or Scapeshift which can give a very considerable edge when playing up against them. So what do you think? As mentioned before this post is to brainstorm ideas and create a discussion on the viability of this strategy. If you were to homebrew this deck what cards would you include in it? Would you use blue or green instead of white or leave it as just black and red? Would a deck like this thrive in your local meta or would it fail horribly? Have you ever made a deck that has played similar to this one? I'd like to hear from you about it. April 11, 2019 10:08 a.m. I would run Flower / Flourish over Traverse the Ulvenwald . Getting delirium seems highly unreliable with this deck and the delirium effect doesn't directly help with this deck's main win condition. Flower / Flourish does practically the same thing as it, however you're waaaaaay more likely to win a clash if you reveal it from Recross the Paths whereas Traverse the Ulvenwald would likely cause you to lose the clash. Flower / Flourish is also a cheaper card, so its a better budget alternative as well. April 8, 2019 9:32 a.m.